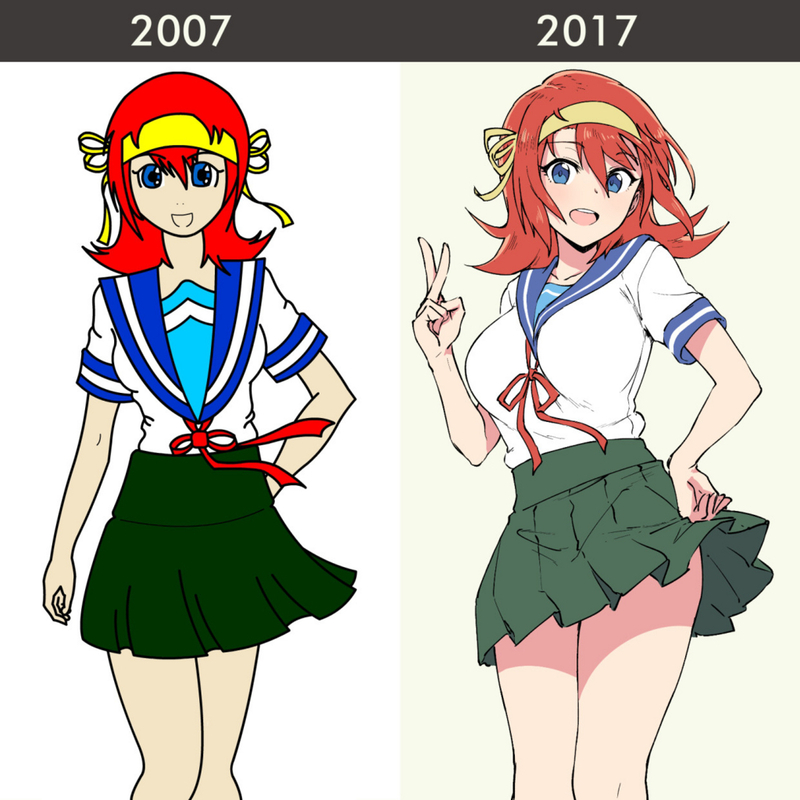 It's been 10 years since I first started drawing digitally. There's actually a bit of a story behind that first picture, and since I haven't made a longer post on my blog for awhile, I suppose now is as good a time as any to write it up. This was actually the first picture I ever drew digitally, I was a pencil & paper artist before this. I believe it was drawn in Macromedia Flash, since I didn't know how to use Photoshop at the time. Prior to this, I used to mostly draw other things like stickmen, or barbarians and paladins. It's funny because I never used to draw girls, but these days it seems that's all I draw. Back in 2007 I was still in high school, and I felt like I was okay at drawing. Looking back, I can see that I really didn't know anything at all, and hopefully in 10 more years I can look back on today and still say the same, because then it'd mean I've actually progressed. The character that I drew was based on 2 shows that had a pretty big influence on me when I got into anime at that time, the first being Suzumiya Haruhi no Yuuutsu, and the second being Kimi ga Nozomu Eien. The characters I looked at were Haruhi and Akane, respectively. I had no idea what an actual school uniform was supposed to look like, which is why the result ended up being so woefully considered. I think, looking back, I'm really grateful that I did actually have some confidence as an artist back then, however unfounded it was. Because I realized that the only reason I've even gotten to the point I have today is because I didn't give up back then. I feel that's very important when you're just starting out. Of course it's important to be able to self-evaluate and identify what you need to improve at, but it's also important to have some self-belief so that the entire experience isn't a miserable one. To be honest, it doesn't even much look like a 10 year difference picture. At most it would seem like 3-4 years, at least by any serious artist. But for me, there have been a multitude of things I've learnt in the time that has taken place between those two drawings, and I'm grateful for the fact this is still a hobby I love and enjoy. I understand that everybody wants to improve as quickly as possible, but at the end of the day, drawing should be enjoyable, and I hope you all have fun drawing, too! Thanks for taking the time to read this, I'll be sure to post a third update in another 10 years.